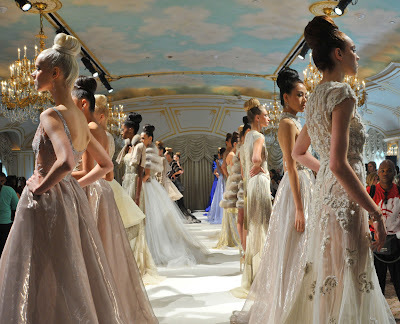 Dennis Basso's show was hands-down the best show I went to. ever laid eyes on = the most breathtaking show of the year! If that show was my every day reality I would be in heaven. I get goose bumps just looking at all the tulle, lace & glitter. lovely! i especially love the first dress..so textured. reminds me a bit of my wedding dress! i had it custom made and it had that kind of top, only not sheer. thanks for sharing!